Note, the fabrics for the project were given to me by Island Batik as part of their ambassador program. Welcome to my stop on the Island Batik Getaway Blog Hop! For this blog hop each of the ambassadors were given a secret bundle of fabric in our 2nd box of goodies. Mine was the gorgeous Blossom line. To allow these beautiful colours and prints to shine, I combined them with Island Batik's solid grey and a white print from the Foundations line called Rice to create a quilt my friend Michelle named Sparkler. The darker grey on the right hand side is from me laying the quilt in the snow for that snowshoe picture. The snow soaked through immediately and left some damp spots. Here are some closeups of the pieced sparklers and the pretty prints they're made of. Do you see the subtle grey sparklers that form as a secondary pattern when the blocks are joined together? I'm terrible at naming my quilts so I was very happy when Michelle said the blocks reminded her of sparklers. That not only named the quilt, but also gave me the quilting motif. I had a blast quilting these meandering sparkler bursts all over the quilt in Aurifil 2600. When I posted asking if the quilted bursts looked like sparklers, one fellow ambassador pointed out that the meandering trails look like the lines left behind when we wave the sparklers around while writing our names in the air. I hadn't thought of that, but he's absolutely right! The pattern for Sparkler is in the works and I'm hoping to soon have it available. What colours would you use to make your own version? I'm already wanting to make another version where the secondary sparklers are more obvious, just to see how that changes the look of the design. Karen, of Sew Karen-ly Created, was also given the Blossom line to work with and she's sharing her quilt today, too. 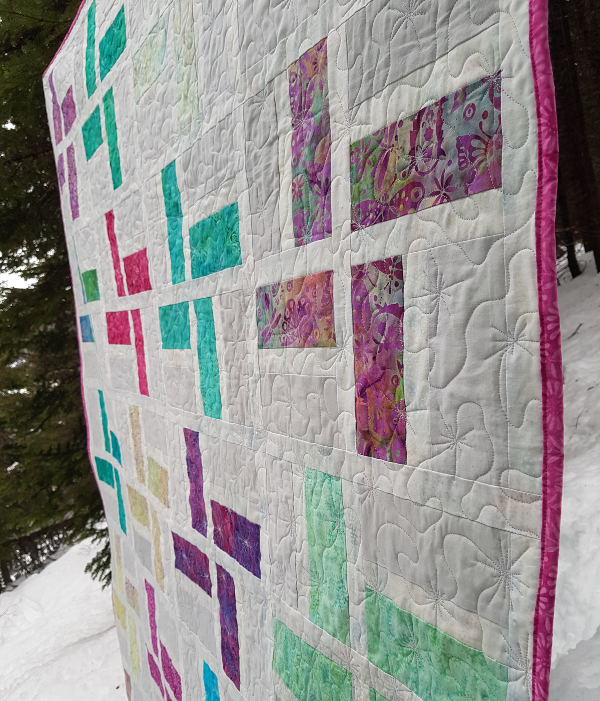 The Getaway blog hop is a month long extravaganza with sooo many beautiful quilts and fabrics to check out, not to mention giveaways to be won. There's a giveaway on the Island Batik blog, plus lots of the ambassadors are hosting giveaways as well. Just one thing before I send you on your way...have you seen my Medallion Magic QAL? We're gathering our pattern and fabrics this month, so there's plenty of time to join in and we'd love to have you! Now here's the full list of ambassadors for the Getaway blog hop. I know there are a lot, but the quilts are all so beautiful I recommend you check them all out! Edited February 4th - The winner of the 2 PDF pattern is comment #36 - Rosalind Gutierrez. Congratulations, Rosalind! Whether you're going for a getaway or hanging out at home, I hope you are enjoying your day! I love how it turned out. Perfect name. I think this would be a great charity quilt. Could do it in a reasonable amount of time. 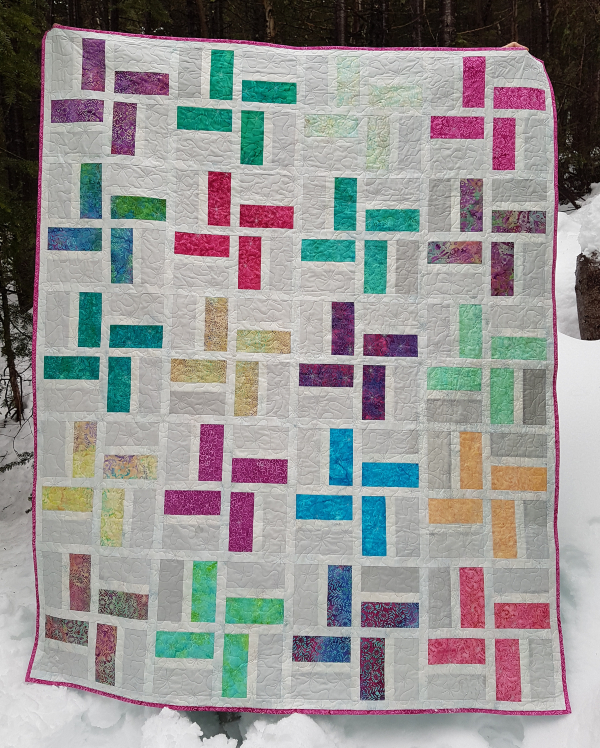 This is a beautiful quit, Leanne, and I love how the name inspired the quilting. It's perfect! So colourful. You chose a great design to showcase the fabrics. Love those snowshoes, a wonderful photo setting, and a super pattern and name. It does sparkle.The Island Batiks in every combination are wonderful. My getaway, to stay with our daughters, in turn, one further north, one much further south, and leave the mess in the spare room ( we have recently moved into our new home) so when I come home,the magic fairy has done the new bathroom, painted the window frames, and put all my fabrics in order. 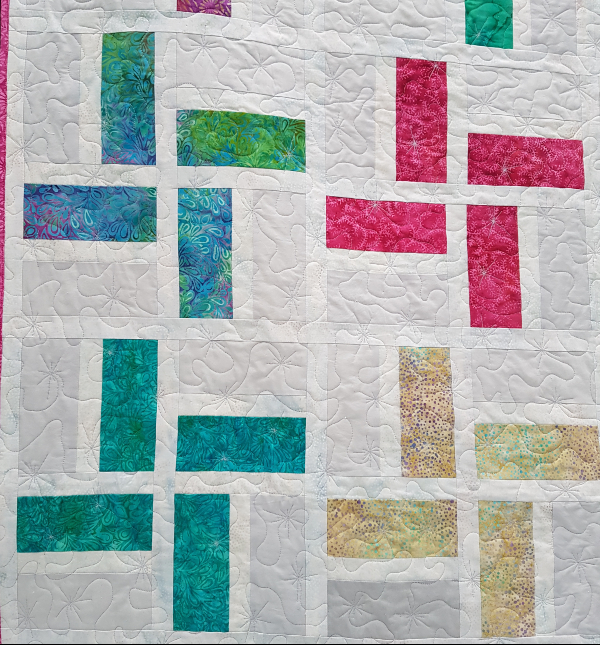 A great design and love the quilting! Beautiful quilt. The grey adds such subtle shading, and your quilting is fabulous!! Sparklers is a wonderful name for such a lovely quilt> I love the white it it, sets off all the beautiful fabrics just perfectly. Love your quilt. My getaway would be a cabin on a lake. Your Sparklers are beautiful. I especially like the "hidden" grey ones. My getaway right now would be a warm, secluded beach. So peaceful! I love how it came out. There are at least a couple of fabrics in that line that I have a serious crush on. your quilt is lovely. i love how you combined both the grey and white. and your sparkler quilting is wonderful. thanks for sharing and for inspiring today. A gorgeous quilt, it really sparkles! I love the secondary pattern in grey and white. I would love to go somewhere warm now. Sparkler is perfect! I, too, have a terrible time naming quilts. I love the slight contrast between the white and grey. I am intrigued that the grey doesn't look the same everywhere. Once again, you created another great quilt. Sparklers is an explosion of fun fabrics and colors! Love the gray and white combo too. Fun quilt design. I'd love to jet somewhere in the Caribbean to escape our cold weather. Lovely quilt from lovely fabrics. Thanks. I love your idea of a staycation - a break from responsibility (I have two small children) without having to PACK to go anywhere! Leaving more time to quilt! What a beauty. I can see myself wrapped up in this quilt and would love to create one. Galapagos Islands is on my radar as my must visit place. Love the quilt. My getaway would the beach in Cancun, Mexico. Love your quilt and these fabrics! I would like a getaway to somewhere dry and a bit warm right now. Those luscious batiks DO SHINE!!! Beautiful. 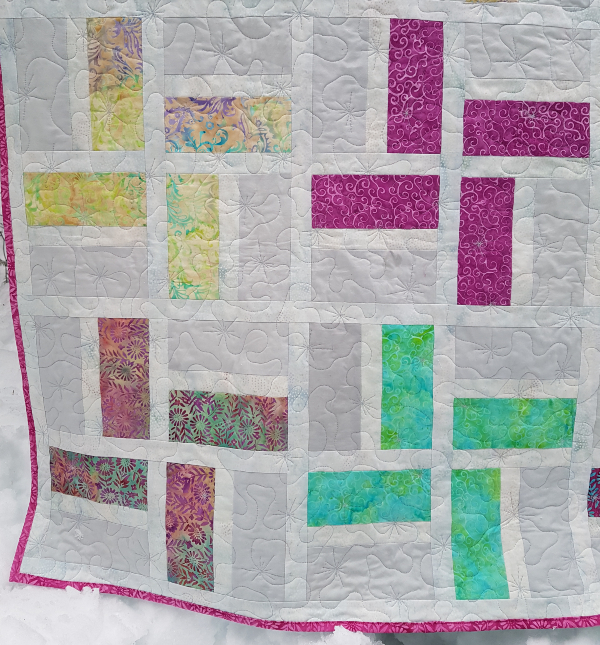 Beautiful quilt to show off those gorgeous fabrics! 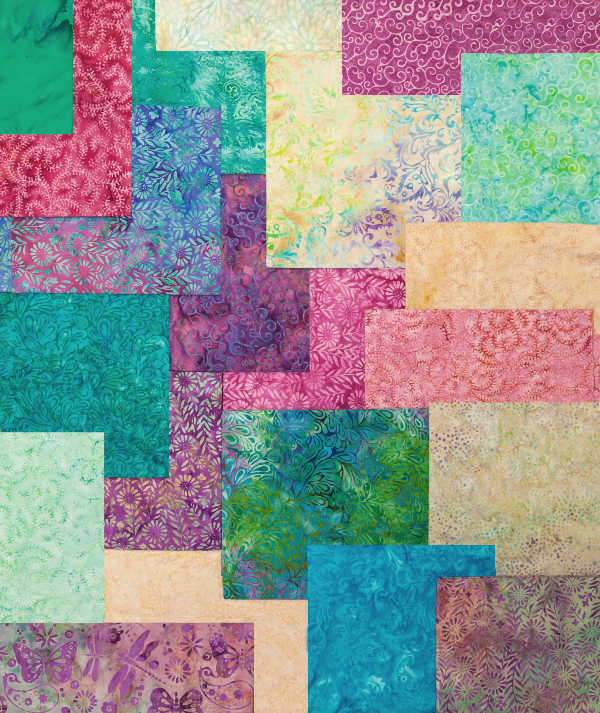 Beautiful quilt , this pattern showcases the pretty fabrics very well ! So simple and gorgeous. It really helps the fabrics to shine, which is also a great tie in to the Sparkler name. Great quilting, too. The getaway I am dreaming of is a sandy beach in Bora Bora...want to join me and get out of the snow?? Your quilt is fabulous...I love the subtle difference between the gray and white, the colors are definitely reminding me of tropical places and your quilting is perfect for it!! My getaway would be the mountains in North Carolina. It would be so different from the weather here in Florida. Thanks for sharing your beautiful quilt. I'm dreaming of a trip to my hometown, Huntington Beach, CA. I'm dreaming of a getaway to anywhere where there is good snow for skiing. This is lovely! 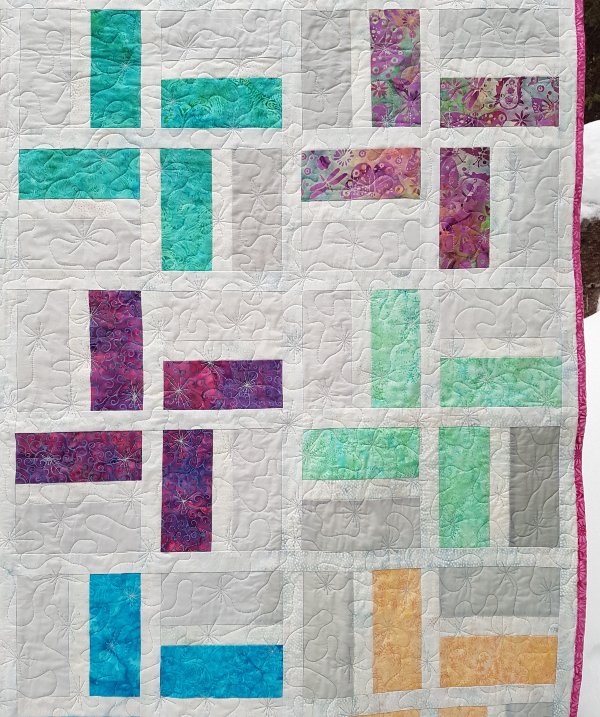 I love the colors, and your quilting pattern could not be more perfect! I'm dreaming of, and planning, a few days down at the Oregon Coast in Lincoln City, or maybe I'll go north this time up around Tillamook or ?? where there are more quilt shop options, LOL. My second choice would also be a staycation if the timing is right so I won't be interrupted. Your quilt is beautiful. 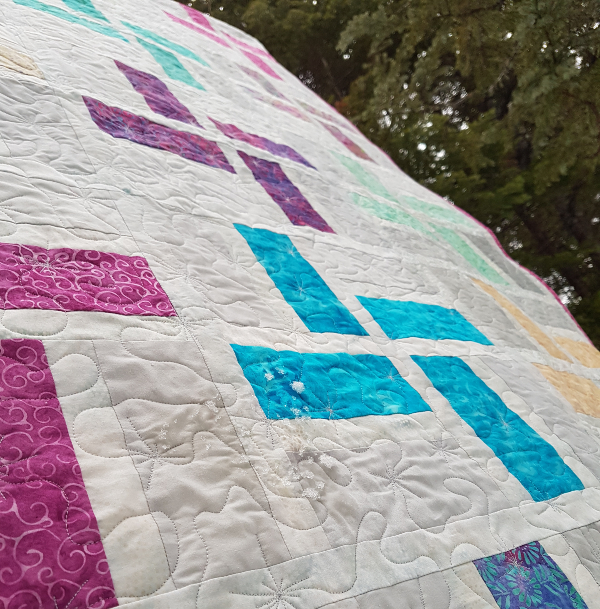 This is my first blog hop; I'm a fairly new quilter and I'm enjoying everyone of you. Learning a lot, too. Haven't used Island Batik yet, but looking forward to it. Such beautiful, happy fabrics! Looking forward to following you, too. 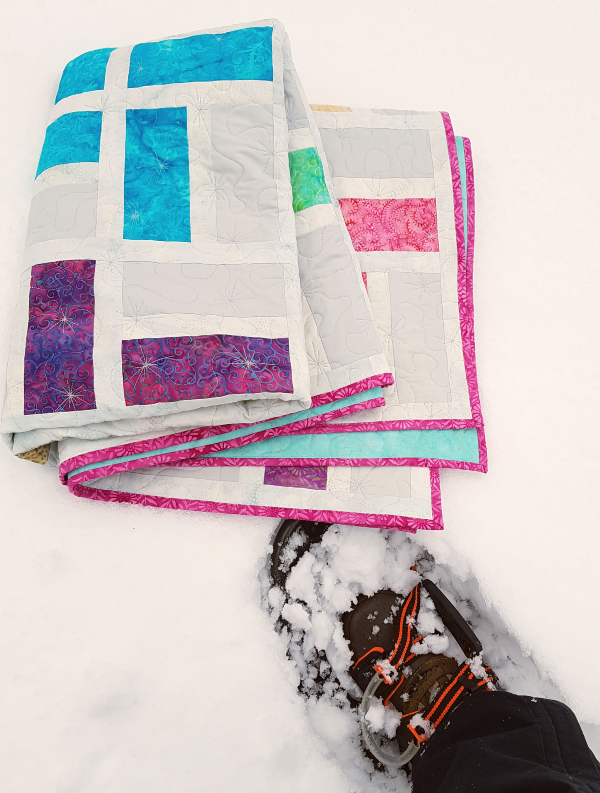 I love that your Getaway quilt required snowshoes. Talk about needing a getaway! Right now, anywhere warm :). I would love to visit the Mediterranean coast of Spain, and Corsica. Pretty sparkler quilt, the grey sets off the batiks. For a getaway, I want to go to Holland, in spring to see tulips and windmills ! I have a jelly roll that I have had for years that I would like to try a version of this with. Oh you are right! those fabrics are so great - and the design you chose is just perfect to set them off!! Beautiful! Great way to showcase the fabrics. Love it! I really love this quilt! 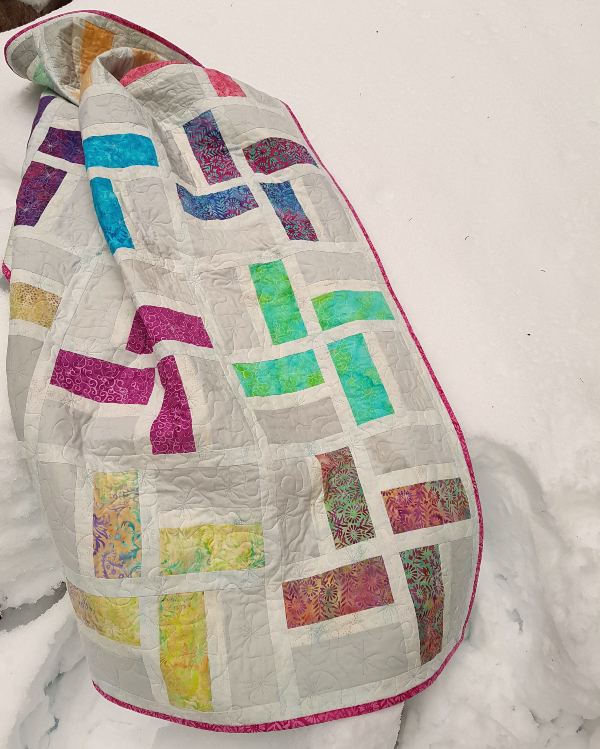 We've finally had some snow, and seeing this bright and happy quilt made me feel nice and warm. Love that fuschia binding - especially against your snowy backdrop! Your quilt is lovely and I like the use of grey for the secondary design. I am looking forward to going to Europe this Fall. However, I would love to have a staycation with no responsibilities and have lots of seeing time. I have many works in progress that I would love to get finished...I'm sure my grandchildren would appreciate it if Nana finished their quilts so they could use them. Give me a staycation in m sewing room anytime. 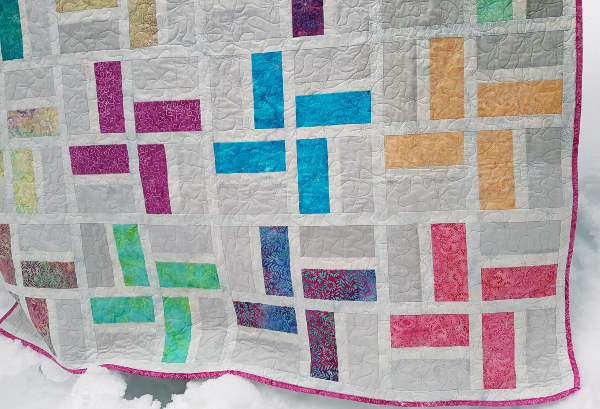 That quilting design is perfect -- I imagine it was a fun one to play with. Congratulations on a beautiful finish! Great quilt.... I adore the connections between the pattern, the quilting and the name. I live on a farm, so not only is a vacation not affordable, it is highly unlikely. A night away is even unheard of. I will take a stay at home and sew vacation instead. Love your quilt.